This is a Sponsored post written by me on behalf of Gaiam for SocialSpark. All opinions are 100% mine. I like to do my yoga workout from my home - being able to progress at my own speed and fitting it into my schedule is the main reason for not going anywhere else. I knew practically nothing about Yoga when I started, so I kept my eyes open for previously used videos and dvd's in my travels. I found plenty, and I would watch them before I used them to see if they were something I might like. It didn't take me long to figure out the ones that I liked the best. They were made by Gaiam, and they always had the best set-ups, instructors, and workouts. Well, now there is another way to get videos for yoga, fitness, and health and wellness, and it doesn't involve fiddling with the video and dvd machines. It is GaiamTV, which is a streaming video subscription that brings all things health, wellness, and exercise right to the computer, iPad, or smartphone. You can take your workout with you where ever you go. They offer over 2,000 titles of all types of workouts - yoga, cardio, pilates, and all the health and wellness info you can use. Many of the top instructors will help you with your workout. The best instruction is important to get the most benefits from your workout. Each workout can be customized for each user, whether it be to loose weight, increase your energy, or sculpt your body. One can make playlists and preview their selections before they use them, so finding the perfect one will be very easy. I think the best part about GaiamTV is being able to to have access to their service all the time - twenty-four hours a day, seven day a week. It is available when I am, with just the workout I want. And it goes with me - I don't have to be in my living room with the VHS or DVD player. I won't be interrupting the TV viewing to do my workout - I can use my computer or smartphone. Gaiam offers a free ten day trial to check it out. Then, it is just $9.95 a month to stream unlimited content. And one can cancel at any time since there is no commitment or strings attached. Right now they are having a contest to win a free month's subscription and a yoga mat. Keep updated on Twitter by following them @GaiamTV. Today was a freezing one outside, a high of 17 degrees. But we were cooking up a storm on the inside, keeping the house nice and toasty and smelling good. We made an extra large batch of cabbage rolls, and while we were at it, we added in a couple of stuffed peppers too. Five pounds of cooked ground beef and pork mixture combined with five cups of cooked rice for the stuffing. And two very large cabbages, precooked to make the baking part quicker. We layered the leaves and filling instead of rolling them, and topped the whole thing with two large cans of pureed tomatoes that are seasoned just right. The baking pan just barely fit in the oven it was so large. There will be plenty to eat, freeze, and share for several meals. And all for under a total of $20. I don't usually get too mad. I tend to take things in stride and work through things that need it. But when that stupid scale told me I gained 1 1/2 pounds this week, I was seeing red. I have been very diligent these last few weeks on my morning and late afternoon exercise routines. And the eating has not been out of control either. It is quite discouraging, and it makes one wonder: why bother? As my husband kept telling me: Because it makes you feel good to do your exercises. Besides, muscle weighs more than fat, but it's denser and smaller. I suppose, but I still despise that scale. I really felt like throwing it right out the door this morning - but I just would have regretted it later. Ever find something while searching the internet that you are sure you can get back to at any time? Other than bookmarking it, which can get very confusing very fast in the bookmark bar, there is a new way. And you can even share your finds with your friends. You don't have to send a link in an email. Posting a link on a social page gets buried pretty quickly as more info gets posted. By using the clipix website, you can save anything you find on the net and get back to it very easily. When you save it, it gets added to a clipboard already set up for the particular subject you want to keep in it. It's very organized and easy to share if you want. 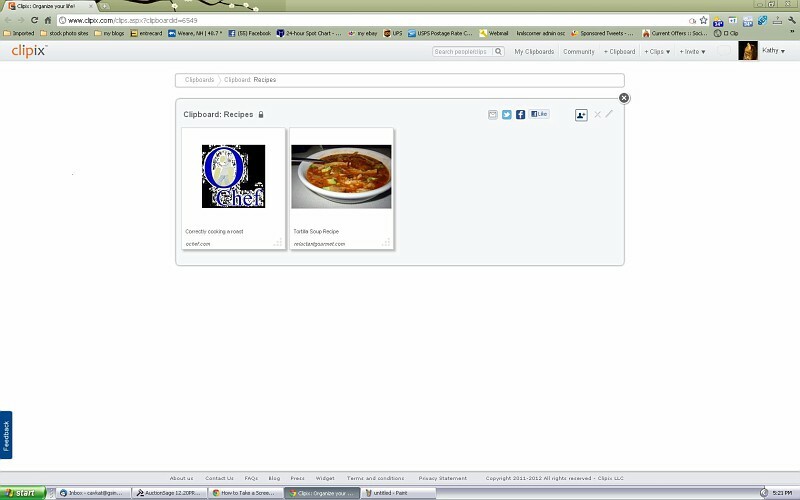 You can also keep your clips private or share them with friends or share them with the entire Clipix community. The above is a shot of the clipboard that I made for recipes. One can share them on Facebook and Twitter, and they can have comments made on them too. Check out the Clipix website to see how easy it is to use. If you find you like it, leave me a comment to let me know how it worked for you. The uses for it are endless!